Natural Health News — It can cause cancer in humans and now the world’s most widely used weed killer may also be lethal for bees. 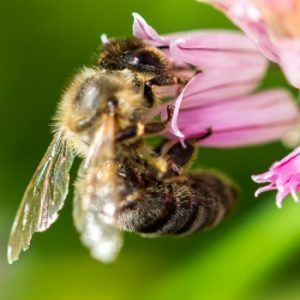 New research from The University of Texas at Austin shows that honey bees exposed to glyphosate, the active ingredient in Roundup, lose some of the beneficial bacteria in their guts and are more susceptible to infection and death from harmful bacteria. Because glyphosate interferes with an important enzyme found in plants and microorganisms, but not in animals, it has long been assumed to be nontoxic to animals, including humans and bees. But this latest study shows that by altering a bee’s gut microbiome – the ecosystem of bacteria living in the bee’s digestive tract, including those that protect it from harmful bacteria – glyphosate compromises its ability to fight infection. The researchers exposed honey bees to glyphosate at levels known to occur in crop fields, yards and roadsides. The researchers painted the bees’ backs with colored dots so they could be tracked and later recaptured. Three days later, they observed that the herbicide significantly reduced healthy gut microbiota. Of eight dominant species of healthy bacteria in the exposed bees, four were found to be less abundant. The hardest hit bacterial species, Snodgrassella alvi, is a critical microbe that helps bees process food and defend against pathogens. More than a decade ago, US beekeepers began finding their hives decimated by what became known as colony collapse disorder. Millions of bees mysteriously disappeared, leaving farms with fewer pollinators for crops. Explanations for the phenomenon have included exposure to pesticides or antibiotics, habitat loss and bacterial infections. This latest study adds herbicides as a possible contributing factor. Official have long insisted that glyphosate is safe for bees, or that bees are nto exposed to the weedkiller in any significant way, but in 2016 testing by the US Food and Drug Administration found residues of the weed killer glyphosate in samples of US honey suggesting that not only are the bees exposed ot it but that they bring it back to their hives.